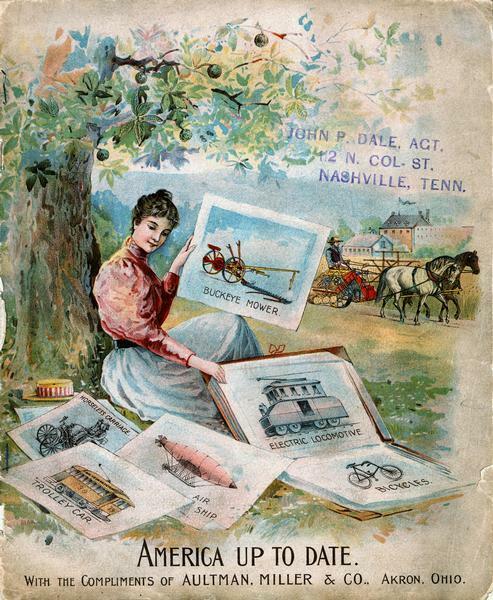 Front cover of an advertising catalog for Aultman, Miller and Company, manufacturers of agricultural equipment. Features a chromolithograph of a woman sitting under tree with a portfolio of prints or sketches. The prints show the Buckeye mower, electric locomotive, bicycle, air ship, trolley car and horseless carriage as examples of modern inventions. A caption reads "America Up to Date." A man operating a horse-drawn grain binder is in the background.